Just like Until Dawn, Sony has given a release date for another one of their PlayStation 4 titles ahead of E3 2015 next week. 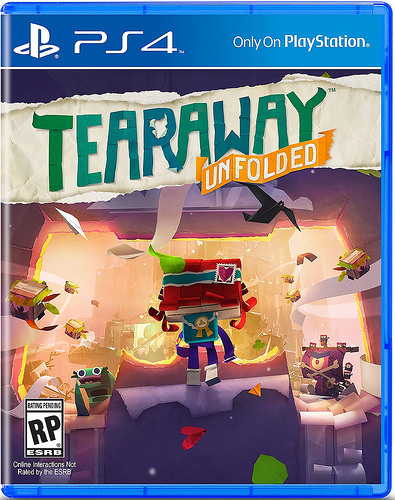 This time around, it’s Media Molecule’s Tearaway Unfolded, which is a PS4 version of Tearaway on PlayStation Vita. You’ll be able to buy it beginning on September 8 in North America and September 9 in Europe for $39.99/£34.99 through retail stores or the PlayStation Store. The Tearaway Unfolded Crafted Edition will include a shiny Gold Leaf and a shining Gold Stamp to wear proudly on your messenger, as well as an exclusive God of War and Journey costumes, allowing you to ‘journey’ through the world of Tearaway Unfolded in style! You’ll also nab yourself eight custom decorations (from franchises such as Lemmings, Gravity Rush, No Man’s Sky, The Order: 1886, God of War, Infamous, The Last of Us, and Killzone), two super cute papercraft plans (Sackboy and Baby Wendigo), and a spectacular Pig Crown. And if that all that wasn’t enough, we’re also including the official Tearaway Unfolded soundtrack featuring all original tracks from the game. Catch stuff hurled out of your TV – and throw it back to solve puzzles and take down the baddies. Guide atoi through dark, scary places by shining the light bar at your TV. Whip up a windstorm to discover hidden paths, and pilot a papery plane by swiping the touch pad.